Here's the inspiring reason why this man did 3,194 burpees ... in a row! Sgt. Jason Mosel is raising awareness about veteran suicide and PTSD. The suicide rate among women vets is 250 percent higher than non-vets. In the pitch-dark, early hours of Saturday morning, as a snowstorm squalled outside, Jason Mosel, a 33-year-old former Marine, accomplished a seemingly impossible feat: 3,194 chest-to-ground burpees in the span of 12 hours. 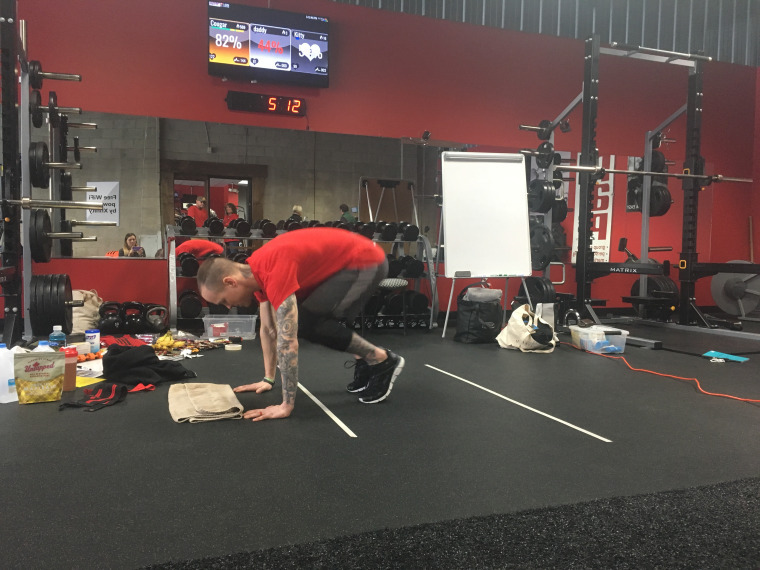 While he didn’t complete enough burpees to set a Guinness World Record, he achieved his ultimate goal: to raise awareness about veteran suicide, raising nearly $7,000 for the Josh Pallotta fund, a non-profit organization dedicated to helping veterans and service members. A group of family and friends gathered at Snap Fitness center, with eyes focused on the center of the room, where Mosel, sweaty, muscular and covered with tattoos, pushed through the last hour. Two security cameras recorded the event nonstop as evidence. Now and then, someone would come in to the gym, take off their snow-caked outer layers, and hop on the floor alongside Mosel to join in the burpees for a few minutes. Mosel and his supporters all wore red T-shirts, with a design on them featuring an American flag and hands reaching upward. "Never underestimate your value to the world," the phrase on the shirt said. At the end of each hour, Jason tore off his soaked T-shirt and put a fresh, dry shirt on. “Just one at a time, keep pushing. Dig deep, you got this,” said his wife, Amber, at 4:50 a.m.
“It’s snowing outside but the real storm is in here,” Mosel joked, as he entered the last 40 minutes. By 5 a.m., he had completed 3,070 burpees. Towards the end, the room would burst into cheers for every 10 he completed. “I had a few sketchy moments, I thought I was going to pass out,” said Mosel, who works days as a field supervisor for Comcast, the parent company of NBC News. He also teaches fitness classes, the Insanity workout, and consults folks who are interested in training for extreme fitness challenges, like Spartan races or Tough Mudder. The grueling exercise suits his mission to raise awareness about the epidemic of veteran suicides in the U.S. Every day, 20 active or former servicemen and women die, according to Veterans Affairs. The mission is very personal for Mosel, who trained for months and survived a suicide attempt in 2005 after struggling with mental health issues following his first two tours of duty with the Marines. Mosel wanted to do the event at night because it’s when many of the effects of PTSD start to appear, and suicide seems viable.